I cannot believe this month is already over with! Oh... I forgot... we get an extra day this year. Hey gals... if you are single this is the year you can ask your sweetie for marriage! Well, yesterday was a blast. We had our first session of the B-a-a-a-d Girls Club at Cinnamon's Quilt Shoppe and it was WONDERFUL! I sure hope everyone had as great a time as I did. 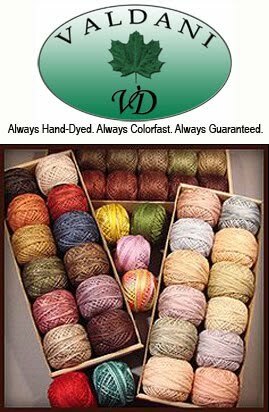 They worked on their "wooly jars" and then got started on their next wool project. Wow... they are making some marvelous stuff! I can't wait to see how much progress they've all made in the next month. I'm already planning their next "treat" and "make-it-take-it" project. We have 35 in the group... no more room! Thanks girls for a SUPER - GREAT day! This is pretty funny looking... don't you think? Well... it's genius ! 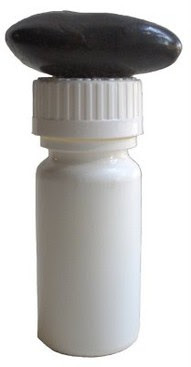 Take an old aspirin bottle with a wide enough opening to hold your HOUSE key. Place it inside the jar - screw on the lid and then glue a LARGE rock to the top. Bury it down in your flower garden and the next time you accidentally lock yourself out of the house... BINGO... there's a key for you. (just remember to put it back!) Isn't that clever? We always used a plastic bag... then when I needed to dig it out from under the planter (in the flower bed) it was all dirty and wet... very icky!!! At least sitting in the mulch it won't be so dirty. Of course... that is if we actually PUT mulch in the flower beds!! hahahahaha! They are getting a little flat and are in need of some attention! I loved this idea too... Take some popsicle sticks and paint the different colors within your house... of your furniture, etc. (just on one side) Write on the back which room or what piece of furniture... so you won't forget (not that any of you would forget....ha....). Drill a hole in the end of each one and put on a key ring. Then pop it into your purse...you know.. in one of those pockets you never use... ! Then.. the next time you are shopping for a household item - you'll have the colors of your rooms handy. Now... my brain just thought of another idea!! Glue fabrics to the stick also... of your handmade quilt in your bedroom, handmade shower curtain, window curtains... If you don't have the fabric - take a VERY GOOD picture - close up and then print from your computer - then tape the paper to the popsicle stick. The exact shades and tones may not be perfect - but it certainly will be better than having nothing with you. Have fun!!! You'll be known as the "popsicle stick queen" before you know it. Now.. I must admit... this is one job in the bathroom that I absolutely loathe!!! Cleaning that silly shower door! Why... I ask you why... can't they develop a glass that will not obtain water marks, sulfer and iron spots???? I just don't get it! We can send men to the moon and we can't stop windows from getting water marks and soap scum on them. It's just silly... don't you think? Well, let's try this trick. We are supposed to use dryer sheets to clean the shower doors! Have any of you tried this? I can't wait to see what it does We are supposed to spritz with a few water drops (to a USED dryer sheet) and then use to clean away soap scum! Check out this cool idea! Make a drawer for all of your electronic doo-dads that need charging! It looks like they have made sweet cut-outs for the cord to lie over (so the drawer can close) then the plugs are laying in the back section.. One of those multiple surge protectors would work great. Cut a notch in the back of the drawer - feed the plug out the back and under the base into the socket. Is this not cool or what! You could even keep the Garmin plugged in and fully charged so it's ready when you need it. 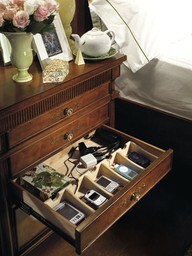 This type of deal would also work great in a cabinet in your foyer... so you can charge - grab - and go out the door! When used on your baseboards it can not only help repel pet hair, but general keep the things that get tracked in and out of our home off the walls and on the floor where it can be swept up. If you have a Swiffer or something like it, just attach the dryer sheet to the bottom of the mop head and run it along as frequently as your house seems to require the chore. It can take a task that should be done once a week (or once a month) and turn it into something that's done every few months or even a few times a year. This ... is just another Annie I found ... that I LOVE!! 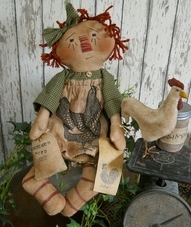 Isn't her little chicken friend cute too??? I love Annies.... not sure why... just do!! AAAAAAAWWWWWWWWWWWW...... they are sharing secrets... can you tell??? I love bunnies! They are so sweet and soft. I've always wanted to hold one of those minature - floppy eared bunny.... I think I must put that on my "Bucket List". It's a small thing... but something I'd love to experience.